Warm & welcoming, this move-in ready, spacious center hall colonial has been tastefully renovated inside & out: refinished hardwood floors throughout; updated kitchen w/stainless steel appliances, 5-burner gas range & wine fridge, granite countertops & breakfast bar open to sunny great room; updated bathrooms w/Italian tile floors; Pella architect series windows; Hardie fiber-cement siding; custom-designed portico; new gutters & shutters; professionally installed hard-scaping & exterior lighting; newer 3-zone HVAC. Two fireplaces: one gas, one wood-burning. Convenient mud-room w/ hooks, cubbies & bench storage. Finished basement playroom & plenty of unfinished storage too. Lovely flagstone patio & covered porch for relaxed entertaining. Located in one of T/E's most sought-after neighborhoods. 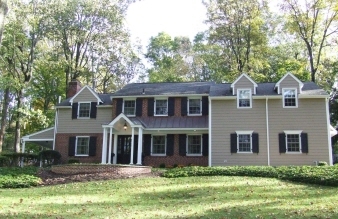 Walk to the train, T/E Middle & Conestoga high school, shops & restaurants.